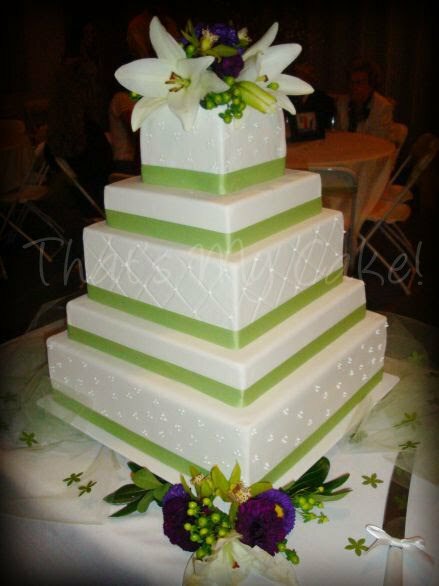 Apple Green and Plum Purple Wedding Cake | That's My Cake! Safe to say this may be my favorite cake this season. I am so happy with how it turned out. The reception was decorated so amazing and the cake fit right in. This picture does not do justice to the purple flowers and lillies put around the cake. The cake is a vanilla confetti cake made with green and purple sprinkles. This entry was posted in Wedding Cake. Bookmark the permalink. That is just breathe taking! I LOVED THIS CAKE! Thanks Ryley for making it so beautiful for my wedding! You were wonderful to work with! From, Sam!